Last year, the archdiocese aired renderings that illustrated two high-rise towers, mixed residential and retail space, as well as gardens and walkways. It is now pursuing development of 2.3 acres around the Basilica of Saints Peter and Paul in Center City. The Archdiocese of Philadelphia on Monday announced it would move ahead with a plan to redevelop its property on Logan Square. The archdiocese said it has formally put forward a “Request for Qualifications” (RFQ) from developers interested in redeveloping 2.32 acres of the nearly 4-acre property between Race and Vine streets from 17th Street to 18th Street, with a lease of no more than 60 years. The Cathedral Basilica of Saints Peter and Paul, the head church for the region's nearly 1.5 million Roman Catholics, its chapel and the archbishop's residence would remain, and any project would need to respect the integrity of the cathedral and its rectory, officials said in a news release. Initial concepts included the possibility of redevelopment – and demolition potentially – of three buildings on the site: the Archdiocesan Pastoral Center, built in 1969, the Holy Family Center (1960) and the former convent for the cathedral (1957). A master plan for the site envisions a high-density, mixed-use development. 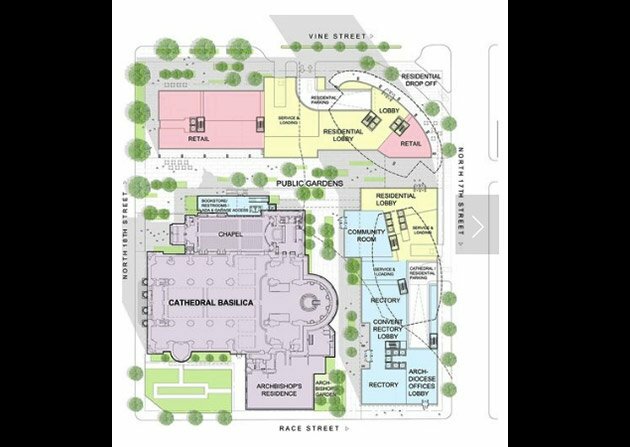 If redevelopment is successful, archdiocesan offices on the property could move a block or two away from the cathedral in Center City. The archdiocese said it anticipates several developers will submit RFQs and that the project will go to bid in early 2018. It did not say how much it expected to reap from the sale. After announcing its intention in 2012 to market several real estate holdings, the archdiocese had initial plans drawn up about a year ago for the possible redevelopment of the property. 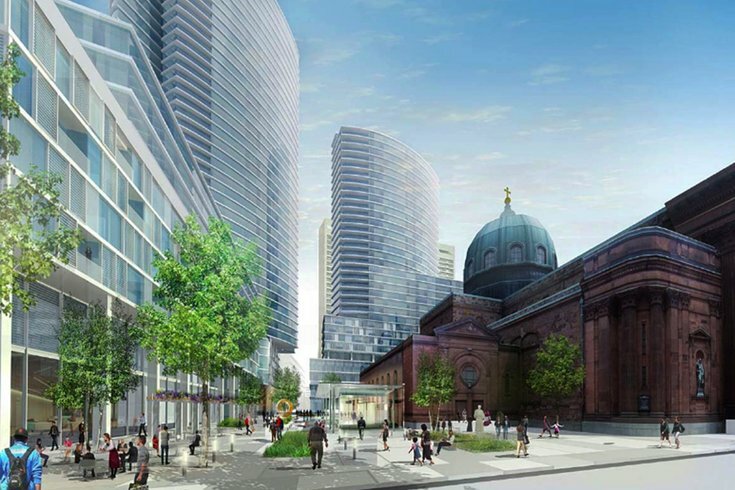 Last year, the archdiocese shared renderings of a possible redevelopment – including two high-rise towers, mixed residential and retail space as well as gardens and walkways – with the Logan Square Neighborhood Association.